Each frame is .1 seconds apart. Hannah Stockbauer's time for this event was 4:06.75. This analysis is unique because it shows the swimmer's stroke while executing a 6-beat kick (as distinct from the 2-beat kick demonstrated during her 1500-m race analysis). Frame #1: As the upper arm is adducted, the left hand, forearm, and upper arm produce propulsion. The right leg is kicking to counterbalance a slight later force component produced by the arm propulsion, which is outside the centerline of the swimmer's body. The right arm is about to enter. The swimmer is in good streamline. Frame #2: The right leg completes its kick and the left leg begins its kick to counterbalance the right arm entry and the slight vertical force component produced by the propulsive left arm. The left arm continues with mainly direct propulsion. A faint smudge off the left forearm and elbow demonstrates the drag pocket produced by the end of adduction and the beginning of extension of the hand and forearm. The entered right arm stretches forward. Frame #3: Left arm propulsion is nearing its end. The swimmer's streamline is demonstrated clearly in this picture. There is a straight line from the left knee to the shoulders. The right arm begins to press down with slight flexion at the wrist and elbow. Much of the press results from rotating the right shoulder downward as part of the swimmer's good use of body roll. The left leg approaches the end of its kick. Frame #4: Upper arm abduction continues to produce a mostly vertical force with the "pressing" right arm. The left leg has completed kicking but continues to counterbalance the right arm's verticality by reducing ankle plantar flexion. The right leg prepares to kick. The swimmer turns her head to the left but does not breathe. Frame #5: As left upper arm abduction occurs, the upper arm is medially rotated, the elbow flexed, and the wrist flexed slightly more. Those movements combine to develop a more horizontal than vertical force production in the right arm. The forearm and hand begin to create significant propulsive forces. The right leg kicks to counterbalance the vertical component involved in the right arm action as well as some forces developed by the recovering left arm. Frame #6: The power of the right arm abduction is demonstrated by the size of the turbulent pocket coming off the arm. That power is to the right of the swimmer's centerline and so the right leg kick serves to counterbalance the lateral force component of the pull. Unfortunately, the slightly downward direction of the pull still produces a vertical force component and is leads to the first half of the pull ending too deep under the swimmer. The head returns to look at the pool bottom and slightly forward. Frame #7: The excessive depth of the right arm pull can be seen as the hand is below the lane line in the picture. Propulsion is now produced by adduction of the upper arm. The right shoulder begins to rise as the left arm approaches the water and the left shoulder is rotating down. The left leg begins to kick. Frame #8: As the right shoulder elevates and the elbow flexes more, the final role of adduction occurs. These events lead to the propelling surface to slip rapidly upward with a momentary loss of force application. The left leg completes a kick and the right leg begins to kick. The swimmer's good streamline continues. Frame #9: The right hand and forearm continue to push back. As the forearm begins to angle relative to the vertical plane, its contribution to propulsion lessens. Shoulder rotation continues causing the left arm to enter and press down. The head turns to the right to breathe. The right leg kicks and counterbalances the left arm downward press. Frame #10: The right arm exits after a relatively long push back. The turned head is lifted slightly and possibly contributes to the extra deep right-leg kick. The left arm is still stretched forward on an extended shoulder. Frame #11: The left arm presses down as the right arm recovers. The shoulders are rotated markedly with the left shoulder being particularly deep. The right leg is still dragging deep to counterbalance the vertical forces created by the left arm press. Inhalation is occurring. Frame #12: It is possible that the breathing action contributes to a very deep left arm movement. The left leg kicks to counterbalance a quickly recovering right arm, which produces a considerable vertical component. Inhalation is completed and the head is ready to return. The size of the right leg kick is noticeable as the lower shank and foot are above the water surface. Frame #13: In concert with the reversed body rotation that has just begun because of the recovering right arm, the left arm begins to be repositioned to create forward propulsion. The upper arm abducts rapidly and the elbow bends. The head returns. Frame #14: The position described in frame #1 is assumed as the stroke cycle repeats. There is not much difference between Hannah Stockbauer's 2-beat and 6-beat stroke patterns. One difference is stroke rate. In this stage of the 400-m race, she was performing 47.87 strokes per minute. At the 1320-m mark of the 1500-m race, she was stroking 44.12 strokes per minute. Those rates were obtained from the competition analyses performed by a group of scientists in Barcelona. In Hannah Stockbauer's strokes, her streamlining is always very good and the range of shoulder roll is extensive. The extent of the shoulder roll facilitates a very long propulsive phase, which is emphasized by the swimmer in a very long push back before exiting to initiate a recovery. Two features deserve criticism. First, the downward pressing action in the early stages of the arm actions is excessive. She should flex at the elbow and medially rotate the upper arm sooner. That would result in an earlier propulsive phase and a shallower initial pull. Second, the excessive depth of the abduction phase of her strokes requires a mid-stroke depth adjustment that results in a momentary loss of propulsive power. It would be better to have a consistent propulsive phase without this inertial lag. The reason for the stroke adjustment is that the hand and forearm have to be well under and relatively close to the body to produce a mostly direct propulsive force. 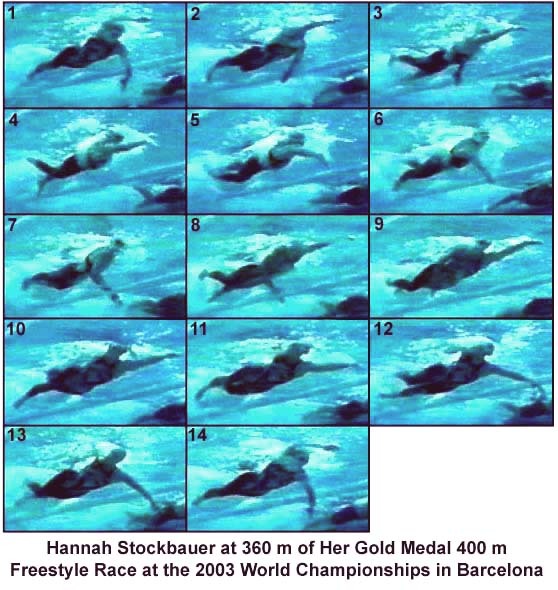 That would not be possible if there was no adjustment in the middle of Hannah Stockbauer's strokes. The adjustment would not be needed if the first portion of the propulsive phase was shallower, as in the strokes of Brooke Bennett, Ian Thorpe, and Claudia Poll. One final feature is the affirmation of the role played by the middle-kicks in the 6-beat pattern. They are correcting kicks that counterbalance the lateral force components of the middle of the propulsive phase.